Camping with family in Phatthalung, & what happened to waterbeds? I made it as far as a small town and district named Phatthalung my first day into Thailand. It was a fairly long day at 300km and dealing with a border crossing. I headed just out of town and down a side road, which had signs for some waterfalls, and figured I could find somewhere to camp. The sun was out of sight and I probably had about 30 minutes of light left. I saw a couple maybe spots and turned around to head back and try one out. I was going to go check at a temple I saw, but first I stopped at a small roadside shop to get some water. It was a great decision. I love how every small decision makes a huge mark on the evolution of my trip. Maybe if I wouldn’t have stopped I would have ended up in another great spot or possibly a terrible one. You never know, but every little detour and decision on the motorcycle writes the story of this trip. The never ending forks in the road will make an impact one way or another. After buying a water from a sweet energetic woman, I asked her if she knew anywhere to camp. She enthusiastically pointed right outside the shop, “no problem”. I was happy with that, but before I could say much they had a new plan. A few of the guys took me across the street to their house, which had a nice yard out front for my tent. I rushed to set up my tent before dark, sweating my face off. They all circled around and watched with curiosity and took pictures with their phones. It couldn’t have worked out any better. They gave me a new bar of soap to take a shower, which is one of the highlights of a long day riding. I don’t know if they knew how grateful I was for for that small gift. They might of had me shower because I disgusted them with stink. Then we headed back across the street to the store, where there’s also another house behind. It’s an awesome family that took me in. There’s a group of brothers, one of their wives (the lady I first met), their parents, and a few of their kids split between the houses. 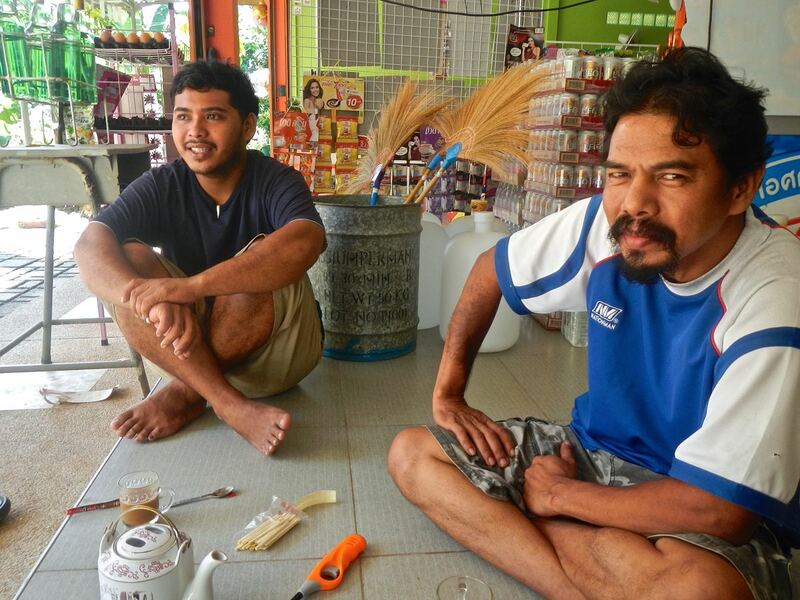 Most Thais speak little to no english, but a few of them spoke some. Enough to have simple talks and figure out what each other meant. She cooked me a delicious dinner with plates covering the small table to pick and choose from. We stayed up drinking Leo beer and talking about random stuff. The parents are so nice with big smiles. They didn’t speak a word of english, but made me feel right at home. The father had a shop full of old bicycles that looked like antiques and could be worth some money. They had big headlights that illuminated when the peddles were rotated. One of the brothers played the guitar and sang some songs. They wanted me to sing a song for them, but a few beers isn’t enough to get my vocals going. It takes some hard stuff to get me singing, and more often than not it will be the Celine Dion Titanic song. I can dominate that song in the right circumstances. The asians ask me to sing a lot, and usually i’ll joke around and sing a short part of something goofily. The thing is, they will always act like it’s very good and they want more. I can’t tell if they’re serious. I didn’t know where I’d be heading the next day and they gave me some advice on a pretty place named Thali Noi, which turned out to be beautiful. I try not to have much of a plan because the best way to find a good path is to get advice from people along the way, either travelers or locals. Eventually made it to bed right before the rains came. I’m so glad I have a nice tent for times like this. It rained in sheets and I thought it was going to crush the tent. It rained so hard that it flooded the area in spots. Somehow, even with the floor feeling like a waterbed, the inside stayed completely dry. For awhile I was preparing for when the dam would burst, but it never did. Thanks REI. It made me think, what ever happened to waterbeds? They have to be one of the coolest inventions to date and feel like I used to see them a lot as a kid. You never see them anymore. Just cause Edward Scissorhands couldn’t sleep on one without destroying it doesn’t mean everybody should be deprived of the joy. The next time I actually live somewhere and have a room, I am definitely getting a waterbed. The revival of the waterbed culture needs to happen in my time. Shoot, maybe I’ll open up a waterbed store, and I will take it a step further and fill them with anything you want. Pudding, vodka, milk, soy milk, ketchup, jello, sand, or just plain wonderful water, depending on the level of firmness you desire. They have those stupid beds that let you use a remote to adjust the firmness number, and advertises it with the catchy slogan “whats your number”. I would steal all their business with my slogan “whats your filling”. It might take a couple years till I’m done going around the world to set this up, so please don’t steal my genius idea and all my millions. In the morning I drank coffee and smoked the local cigarettes with a couple of the brothers. They use pieces of palm leaf the size of a rolling paper, which have a natural curl to them so its not too hard to add a little tobacco and roll it up. Those things are potent, and if your not a smoker they giver you a big head buzz. Before I headed off, the woman cooked me a really nice breakfast to start my day. I tried to offer them some money, but they refused it. It’s an amazing feeling when someone takes you in and cares for you the way they did. In a strange way it was a little hard to leave, but it always feels good to be back on the road. I’m glad I took their advice and went over to Thali Noi Lake. The road there had lots of cool stuff. I stumbled upon a big overgrown temple area named Wat Pa Li Lai that had tons to explore. At the end on a long pier were a bunch of high school boys hanging out and I drank a little bit of Lao Kao rice wine with them. I never saw another person around the temple area, but there was a scary sign for an insane dog. There was some really neat stuff, but the best was the crocodiles. I had seen a sign saying they were there, and this combined with the insane dog sign had me walking around for twenty minutes super nervous and ready to climb up a tree. Luckily I found them in an enclosure where I couldn’t be food. Also along the way was a river mouth where they were traditional fishing with massive nets. The huge nets were rigged to long poles that put them out, and used a contraption to lower and raise it easily. When he raised it out, he would use a net on a long pole to scoop up the fish. He sat in the shack repeating the process all afternoon. It doesn’t get much more simple life than that. Thali noi was a gorgeous spot. Unfortunately all the water lilies hadn’t really started blooming yet, which sounds like an incredible sight. There were a few here and there. From a high tower you can get views out over the area. The lake is full of lilly pads and lush green vegetation, and the clouds reflect off the water to add a cool look. The fishermen have little routes all through it, coming and going with their colorful wooden boats. You can hear the two-stroke engines coming for miles engines. I don’t think many foreigners come to Phatthalung, and the local people were amazing. They really got a kick out of seeing me, and no matter how much Thai they spoke, and no matter how fast they spoke it, I never understood a word. Whenever I see little roadside markets in rural areas I try to stop and grab some snacks and take a wander. Each booth smiles and giggles, and word goes around that a faring (a person of European ancestry) is on the loose. The ones who know a couple phrases of english practice them on me, and then have no idea what I say back. The best food is at these places. I always search out the bags of curries with sticky rice. Out away from the tourist centers is like a whole new Thailand in the best possible ways. 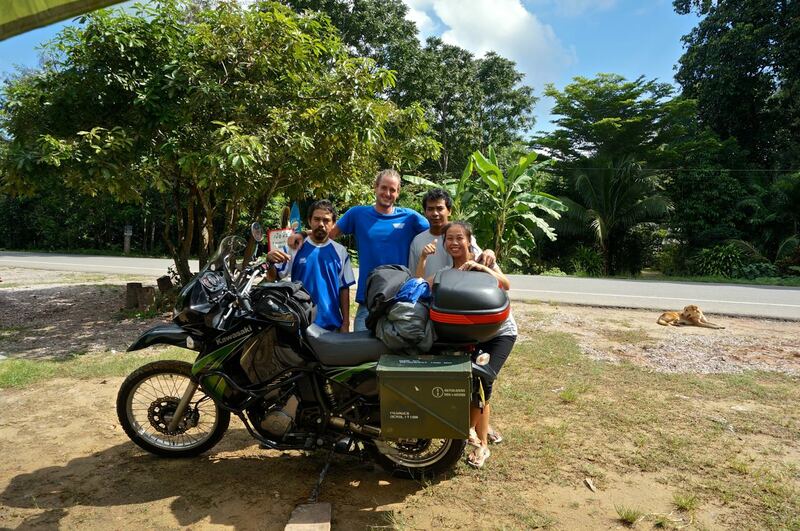 This entry was posted in camping, Kawasaki KLR650, markets, Motorcycle world travel, Photography, Thailand travel and tagged adventure, best, camping, family, food, locals, lotus, motorcycle, phatthalung, route, south, Thailand, thali noi, travel. Bookmark the permalink. 2 Responses to Camping with family in Phatthalung, & what happened to waterbeds? I just love how you meet the locals wherever you travel! You definitely must have a perspective that most of the rest of us don’t have. I wish I could experience just a little of that but I bet traveling alone like you do offers you more of these opportunities. They see you alone and you are so outgoing!